I never considered myself the “wingback” type, but for an affordable $35 it seemed like a good buy and would help fill an empty room in our new home twenty one years ago. The seam on the pink cushion is busted but other than that it doesn’t look much different today than back then. The chair served us well for the next twenty years by just moving it around from house to house and room to room whether it be a bedroom corner, a music room, a study, or a nook in my kitchen. But over the years, my taste in color, style and fabric also changed. This chair had been through the sea-foam green and dusty pink decade and then with the help of a slipcover, went on through the gold and burgundy years . 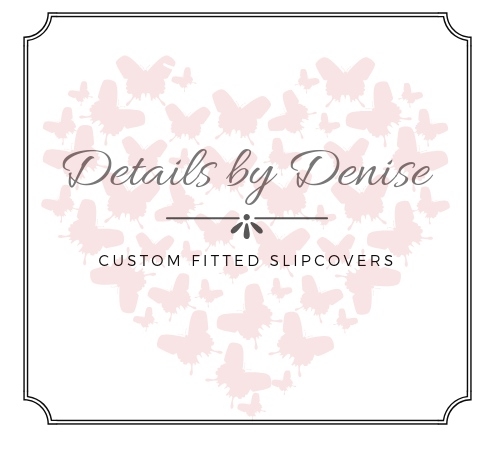 It would not only be my first piece to slipcover but later served as my inspiration for Details by Denise. I found an inexpensive home décor fabric, a slipcover pattern, some self-motivation and eventually finished it. These days I am feeling a lot more neutral…with a touch of blue. So, with a new spot for it in a corner of my lake house bedroom, it was time for a new slipcover. I have always wanted to try a fabric combination and wingback chairs are perfect for this concept. I picked out a two-toned brown striped linen, and a blue and brown plaid. I had two challenges…. dealing with stripes and matching plaids. I made the cushion with plaid on one side and stripe of the flip side to change it up if I wanted to, but I really like the look of the plaid. I only have one wingback but I am sort of partial to it. I can’t bear to part with it, so I guess I will keep reinventing it as my mood or colors changes. You can never go wrong with something neutral for slipcovers for the most versatility, but sometimes you just want it a little unexpected and interesting. You could consider using old quilts, chenille or matelassé bedspreads, ticking or drop cloth for parts or all of your slipcover. Pinterest is a wonderful place to search for ideas. If you have ever wondered about slipping a piece that needs an update, I would love to help you design it and make that thought a reality. Now is the time if you want it done before the end of the year.